Combine cooked chicken, half of the BBQ sauce, ranch dressing, tomatoes, and white cheddar. In a baking dish evenly spread chicken mixture on each noodle to within 1/2 in. of edges. Roll up and place seam side down. Top each roll with remaining BBQ sauce. Uncover, sprinkle with mozzarella cheese. Bake 5 minutes longer or until cheese is melted. Top with chopped green onions. Let stand for 5 minutes before serving. Enjoy! Ooooo.... I love this idea! :) Very clever! Very interesting idea! I like it! looking forward to trying it! For some reason I like lasagna roll ups more than a big pan of lasagna. More fun to make too. Stopping by from Simple Suppers. 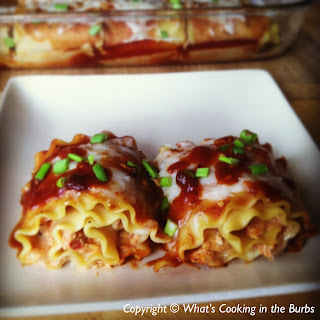 I have never tried lasagna roll ups! These look really good. I also think the use of BB! chicken is great! Not your standard lasagna! Oh I am bookmarking this one to make!!! So delish! Thank you so much for sharing on Show Me Your Plaid Monday's! Thanks for bringing this over to What'd You Do This Weekend. It looks so good. Bridget these look amazing!!! Thanks for sharing another fantastic recipe. This sounds absolutely delicious! What a yummy dinner idea! Featuring tonight! Thanks so much for sharing at Mom On Timeout!